The White Cube in Masons Yard and Victoria Miro Mayfair, on St George Street are both showing exhibitions of Far Eastern art, both exhibitions include well established artists from China and Japan and deal with aspects like ‘representation versus abstraction’ and exploration of ‘the self’s relationship to the infinite cosmos’. In all three Victoria Miro galleries across London the work being showcased is that of Yayoi Kusama, a Japanese artist named among TIME magazines ‘Top 100 Influential People’. In the gallery in Mayfair, which is the gallery I visited she is displaying fourteen paintings under the collective title ‘My Eternal Soul’. They’re all highly abstract with figurative elements. Figurative motifs included across the paintings are; faces in profile, eyes and polka dots, giving the paintings a human element. Her style is improvisatory and fluid and although shares affiliations with many styles such as Surrealism, Minimalism And Eccentric Abstraction, it does not conform to any singular classification. In The White Cube the gallery in Mason’s Yard, they have brought together nine different Chinese artists who explore modes of abstraction in recent Chinese painting in their pieces. All the works are completely different, ranging from layering shimmering lacquer on convex canvases to larger scale ink wash pieces, yet they all contribute to the ‘rich dialogue of abstraction’ in Chinese art. In contrast to western abstract art, abstraction was never alternative nor in opposition to traditional figurative practice and because of this has developed in different ways to the west. The art has been influenced by a diverse range of factors like Taoist Philosophy and traditional Calligraphic practice which is evident in this exhibition within Yu Youhan’s work which uses a lot of block lines and black ink. Some of the pieces that really stood out to me were Jiang Zhi’s ‘System Errors’ pieces. 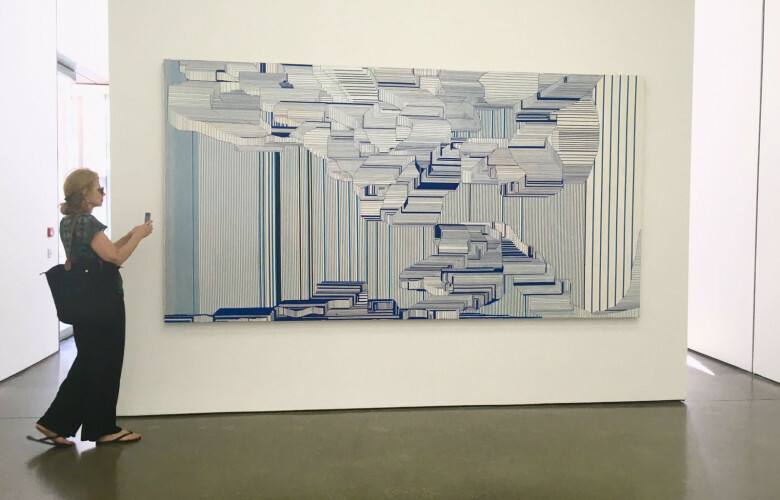 Part of an extensive collection of similar work under the same title, the two displayed in the White Cube both use cool blue tones, and are reminiscent of natural forms such as waves, this completely contrasts with the subject which is a systematic glitch on a computer screen. They hover between representation and abstraction and are very impressive due to the complex patterns and forms, and considering they are painted free hand they ‘move seamlessly from screen to canvas’. I think these exhibitions in the West End are definitely worth a visit, the styles of these artists from the Far East are very different to the Western styles of abstraction due to a completely different history.